Foyles, a family owned and run bookshop begins it's big move today. The bookstore was created in 1903 by William and Gilbert Foyle. The teenage brothers failed their civil service exams so placed an ad in a periodical to sell their text books. The response to the ad was so overwhelming that they quickly realised that selling books was a better idea than the civil service career they had studied for. More text books were found and their first shop was opened, and so began a life long venture that is now managed and owned by the third generation of the family. The new store will be in the premises of the old St Martin's university next door at 107 Charing Cross Rd and will open with a grand festival of literature and culture from 11 June to 5 July. Not far from 84 then? 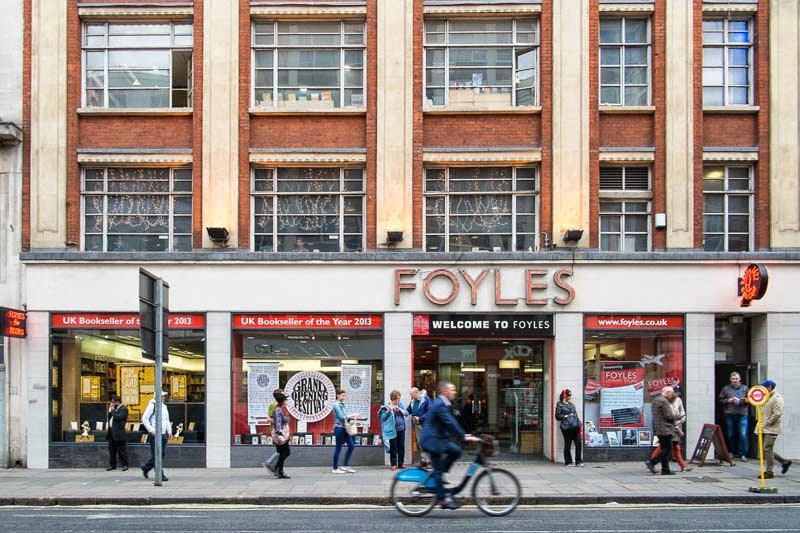 I've been inside a Foyles store a couple of times but I also remember on one of my very first trips to London going into a book store that was overstuffed with books and seeing the clerks us an abacus to total things up. Good to see it's still around. So many bookstores seem to be going the other way. If Foyles is still successful today as a family-run independent bookstore, then I applaud them. It is one of the hardest businesses, unfortunately. As I was leaving your page, I saw Angie's comment about "Not far from 84 then." That brings back memories. I read that book when it was new and a couple of times since then. What a sweet book!